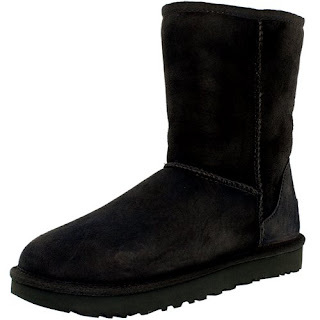 Right now Save on a Ugg Classic Short Boots for $55.99 after promo code APPAREL20 with free shipping at Rakuten.com. The updated Ugg Classic Short II combines comfort, warmth and iconic style in one great wear-everywhere boot. The famous shearling insole is as luxurious as it is practical. Sheepskin's thermostatic properties ensure that your feet maintain a comfortable temperature while you're waiting for the bus on a chilly morning or cozy inside drinking coffee. A new pretreatment process protects Ugg boots from water and staining and keeps feet dry. The innovative treadlite by Ugg TM sole improves traction on icy sidewalks and provides the cushioning you expect from this Aussie classic. You'll love the look of these water resistant snow boots. Women's Uggs are the always the right choice for relaxed fashion. Pull this boot on and wear it straight up or give it a cuff. It's the perfect height to pair with all your pants and jeans. No matter where your day takes you; school, work, play and parties are all more fun when you wear Ugg boots. If you've never owned a pair of Uggs, now is a great time to discover this famous brand from Down Under. Valid through 06/18/2018 or while supplies last.